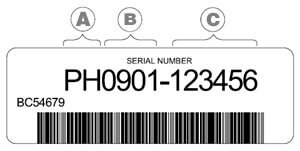 This Example Serial Number is for a (PH)Precedent I2 Excel (0901)Year-2009 Made the 1st Week (123456)Unique Number For This Particular Cart. 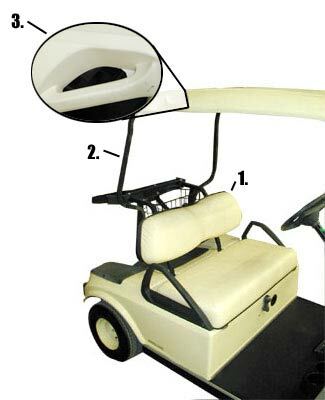 On Club Car® Golf Carts prior to 1981, you can find the serial number by raising the seat and locating the aluminum, I-beam frame section closest to the batteries on the driver's side of the car. If the serial number plate has been removed, you can confirm it is a 1975-1980 model if it has two brake pedals and one accelerator pedal. 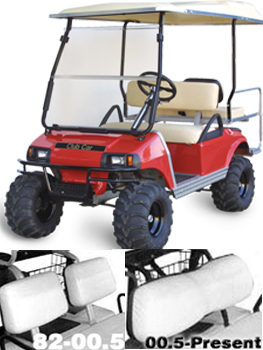 1982-2000.5 Club Car®s have a thin top while the 2000.5-present models have a thicker top with handles on each side of the back third of the top. Note: Both models shown above were made in the year 2000. 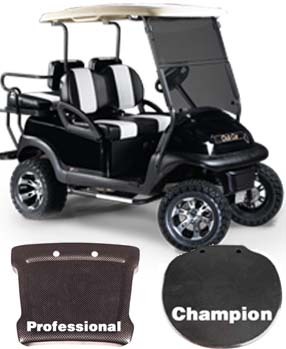 Therefore, if your Club Car® is a 2000 model, we must know which style (one seat back version or two seat back version) you have so we can provide you the correct accessory or part for your vehicle. 1982-Present DS Models have a distinct square front nose with a small black plastic bumper on the lower part of the front end. 2004-Present Precedent Models have a more rounded front nose with a wide black plastic bumper that wraps all the way around the cart. The DS Models do have a split year which is easy to tell just by looking at the seat backs. If there are 2 individual seat backs that is a characteristic of the 1982-2000.5 models. If there is one continuous seat back that would be indicative to the 2000.5-Present models. The Precedent will have 2 sub models which you will hear referred to as the “Champion” or “Professional” models. Easiest way to tell is the steering wheel,if you cart has a square center it is the Professional if it is round you have a Champion. Note: If you have ANY questions regarding your cart model please feel free to contact us 877 340 3606. 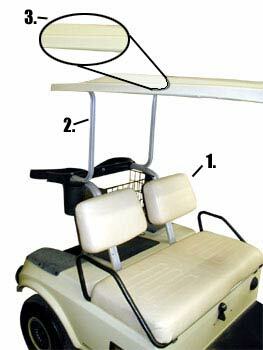 The following is a table showing identification numbers, type and model of Club Car® Golf Carts.